This morning we heard a big crash in the backyard. Uh oh - Laydee got into something. So we went out and she was standing guard next to her partially dead possum. A pretty big one. 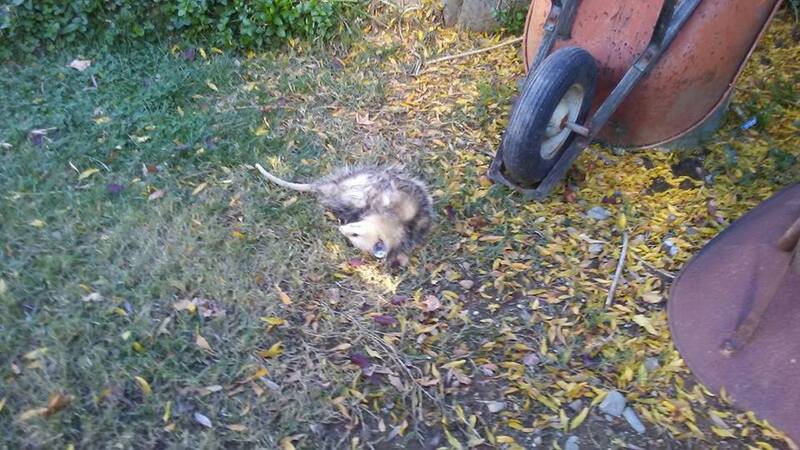 At first, we thought the possum was completely dead but then I saw it's ears and mouth moving. I don't know if that was just nerves settling down like dead bodies will seem to move; we weren't going to take any chances. So we brought Laydee back in and my husband had to finish the dirty deed. Today was garbage day and they had already picked up and that thing was BIG and it will start smelling soon, so we are going to go out later at night and dump the body. Our Humaine Society charges. That's crazy. We have enough open space around here to just let the possum go back to the earth. You know, Dust to dust. Laydee has since been prancing around- you can just tell she is all proud of herself. I thought it was just going to be playing possum...guess not. Ugly things, had them living in my crawl space once and then in my basement, managed to get them out but it was some ordeal. Outside I believe they are beneficial eating nasty bugs and stuff, but what are you going to do, a dog is going to be a dog from time to time. It was beyond, playing dead (possum) kinda sad really. Laydee messed it up pretty bad once my husband turned it over. I live in a rural area. It can be interesting watching nature at work with carrion. It sounds gross but it's not. A few years ago, a raccoon was dead at the side of the highway. I called about it but this is a semi-rural area and they never got to it. So I watched it decay - when I drove by. Sad. That is one big possum! How can the Humane Society charge for pick ups like this? Doesn't seem right. Your solution seemed reasonable though, though I wouldn't have been able to do it myself, hubby is reasonable for removing "road kill" and the likes. I felt awful about it last night. I kept asking was there any possibility that it could of survived and he said, No. He said, he didn't like what he had to do, but that it was the humane thing to do. I've buried more than my share of ugly rodents...squirrels, groundhogs, possums, etc. I hate it when they die after the after the trash man has come. I especially do not like it when some coyote or hawk has eaten half an animal and left the rest. I've dealt with dead birds and rodents - my first possum. In fact, I have never seen one in our area before. We have raccoons- but they must be smarter than this poor possum because the raccoons never come into our yard. You are much braver than I. Two years ago, my coonie and beagle killed a racoon in the back yard (it was a little one I think separated from mom or they would have been the ones on the bad end). I called the animal gus-if only to have it tested. Dog had to have booster shots. When it comes to adult racoons and dogs, the dog will generally lose. Of course, we have cyotes as well. Sigh. We had a possum that got trapped in our garage all night. In the morning my husband found it in a open bag of top soil that it had knocked off of a shelf. He thought it was dead it was doing such a good job of playing possum, but as soon as he dragged the bag of top soil onto the lawn the possum calmly walked out and across the street!